When you're flying around Europe, and your frame of reference is the US, you quickly notice some differences. (And I can only speak to my experience in coach, on cheap flights.) For example, I often found that my assigned seat was occupied, and it was necessary to sit elsewhere. If you want a window seat, try to be near the front of the line to board the plane. If you happen to find yourself in an empty row, you can lie down and sleep across all the seats. (I never did this, and probably never would, because I'm self-conscious about taking up space.) Sometimes people stay in their assigned seats until the Fasten Seatbelt sign is off, at which point there is a great migration. When the plane lands, don't be surprised if the passengers around your burst into applause. But also don't be surprised if they don't. If you want to clap, but don't want to be the only one clapping, hold your applause and feel it out. Alternately, you could be the one to get things going. My first view of Poland: grey, snowy Warsaw, from the plane. In my little video clip, you can see about the extent of what I saw of Warsaw, other than the inside of the airport whizzing by me as I ran to catch my plane to Gdańsk. I landed in Gdańsk, found the train platform, and donned my ushanka. 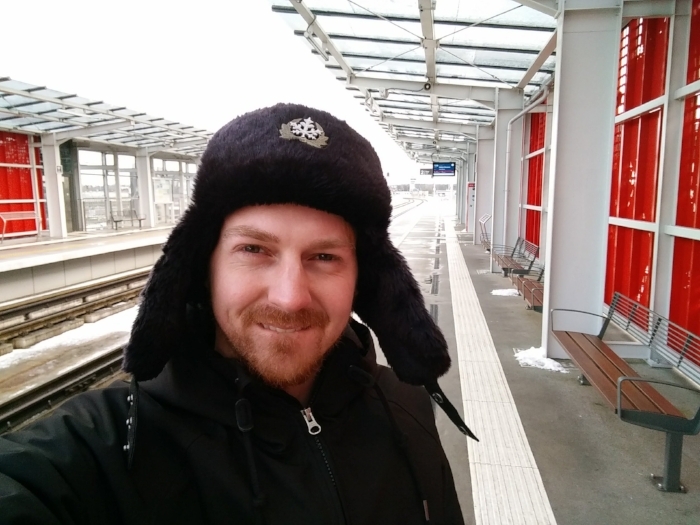 Here I am wearing my ushanka on the train platform at the Gdańsk Airport, with some snow visible here and there behind me. In Gdańsk, my lovely hosts were Iza and her cousin Ola. Iza met me at the train station and guided me back to her flat, where I dropped off my things before heading out to see the sights. A view of Long Lane from Golden Gate, already in shadow on this short winter day. In the distance, Ratusz Głównego Miasta (Main Town Hall), home of the Gdańsk History Museum, is still enjoying some daylight. Gdańsk had a nice, cozy feel to it, as did the show that evening. Iza and Ola were such sweet hosts. There were about a dozen people, mostly from Couchsurfing, in attendance, and they were all so nice and interesting. Ola was really familiar with my music already, and she made some requests. I'll make sure to practice "Fall" before my next visit to Gdańsk! I'm very grateful to them for opening up their home for this event. After the show, Iza and Ola and Klaudiusz had an amazingly entertaining little dance party... I knew I needed to sleep, but when "Toxic" started playing I had to stay and watch. Very, very early the next morning, Iza helped me get on my way to the station, and by no small miracle I found the bus that would take me to Kaliningrad. The friendly driver noticed how flustered I was and, smiling, said, "Spokojna."